SAP announced the consumption based experience for the SAP Cloud Platform (“SAP Cloud Platform: Ringing in the New Year with an Exciting New Consumption Experience” link). With the subscription trade-in program SAP recognizes the subscription contract value and makes it easy for the customer to join this new model. The trade-in of the existing subscription licenses is possible at any point of time. Still some entry criteria need to be fulfilled by the subscription licenses to be eligible for the trade-in. The scope covered by the trade-in program is about applicable services on the SAP Cloud Platform, any SaaS solution like Ariba, Hybris or Successfactors are not eligible for this trade-in. Some other restrictions currently apply where our field representatives will assist you. SAP recognizes pre-payments by the customer for the subscription contract. Any open pre-payments will result on a credit note for the customer and will be balanced with any future invoices. What does this trade-in mean for the availability of the services currently covered by a subscription contract (SC) and the necessary changes to the global account? The following three cases cover the trade-in scenarios. In the first case the customer has a global account (GA) and is not using any service productively or does not intend to use them anymore. In this case, the GA will be terminated, when the contract is canceled and a new GA will be established, when the contract for the consumption-based model is signed (Cloud Platform Enterprise Agreement = CPEA). This case does not require any technical changes. In the second case all services on the GA are available in the consumption-based model. In this case the entire GA will be moved under the new commercial layer. For this case SAP ensures that the existing GA will be moved under the new contract without any disruption of the service delivery. The third case is more complex, because it presumes a mixture of services that are available as consumption-based or as subscription only on one GA. A simple move of the global account under the new contract as in the second case is not possible, because a mixture of consumption and subscription in one GA is not possible. The metering and billing would not function correctly. 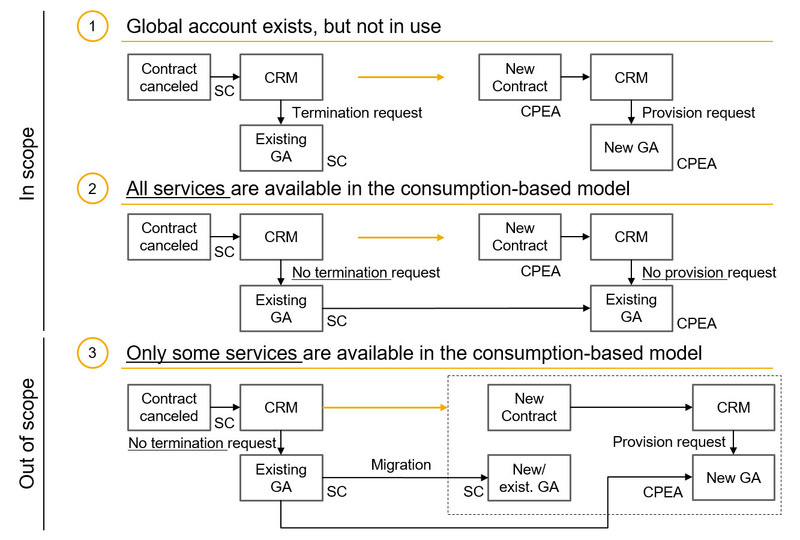 SAP will support the customer in preparing the GA for the trade-in case and to transition all services not available as consumption-based into another GA.
How does it look like from the contractual perspective? The customer need to sign the CPEA for the consumption based contract. If the subscription contract includes SAP solutions not available in the consumption-based model, SAP’s field representatives will help with the contract separation.